Christmas Lollipops. You get an assortment of Christmas themed suckers including Christmas trees, santa's, penguins, elves, Christmas stockings and snowmen suckers. 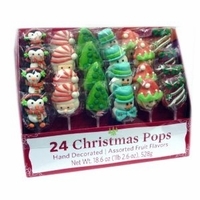 Each Christmas lollipop is a hand decorated jell pop in assorted fruit flavors. Each box has 24 Christmas suckers, these are perfect to use for your stocking stuffers, holiday parties or to place on top on your Christmas presents.